This entry was posted in Uncategorized on September 28, 2014 by louiseturner. It’s been a whole year since ‘Fire & Sword’ was launched into the world, and what an exciting year it’s been! I’ve participated in a number of author events, interviews and virtual blog tours, with more to follow, and so far the reviews have been really positive and encouraging. The follow-up to ‘Fire & Sword’ is ready to send to the publishers (news on progress will be forthcoming, just as soon as I find out what’s happening), and I’m currently working on a third ( maybe even a third and fourth) novel. Above all, I’ve had the good fortune to meet a bunch of lovely readers who have been really supportive of both the book itself and my work in general. As any writer will tell you, this makes all the difference when you’re engaged in such an isolated and solitary vocation as writing. Anyway, to celebrate this milestone, I’m giving away six copies of ‘Fire & Sword’ in e-book format. To be in with a chance of winning, just leave an appropriate comment on this blog entry before the 12th October 2014, when I’ll pick six random names from the list to receive a copy. To those of you who have read the book/bought the book/reviewed the book so far – thank you! Your enthusiasm and encouragement has been much appreciated!! Here’s to the next year – if it’s half as exciting as the last one has proved to be, I’ll be more than happy. This entry was posted in Uncategorized on September 27, 2014 by louiseturner. A Giant Leap For A Bold Small Press!! It is with great pleasure that I can announce that Hadley Rille Books has launched its summer crowdfunding campaign on indiegogo. HRB has been steadily growing through the years, and is earning a solid reputation for delivering highly regarded and critically acclaimed books, often representing narrative voices that are under-represented within mainstream literature. They’re also great supporters of female authors like me! Steered by their helmsman Eric Reynolds, HRB have produced a varied list which includes speculative and science fiction, fantasy, and -of course- historical fiction like Fire & Sword. Their aim is to raise $12,600 to help expand the business – this will allow them to invest in more publicity, as well as help them support more writers and help their existing authors produce more work! I’m delighted to report that in the first day they’ve reached just over $1000 of their target, but of course it’s early days yet and they need as much support as they can get! So please, take a look at the website (link provided below) and better still, spread the word, whether it’s by blogging or by Facebook/Twitter or even by good old word-of-mouth!! Here’s the link, so what are you waiting for? This entry was posted in Uncategorized on June 17, 2014 by louiseturner. ‘Fire & Sword’ Virtual Tour! The ‘Fire & Sword’ virtual blog tour is now underway! Reviews have already been posted at the Mad Reviewer blog and the Flashlight Commentary blog today, with an interview scheduled for the Flashlight Commentary blog tomorrow. For full details, why not check out the itinerary on the link below? From there, you can follow my progress as I continue on this great adventure! This entry was posted in Uncategorized on May 5, 2014 by louiseturner. It’s the 1st of May, and I’ve just stumbled across the Historical Novel Society’s review of Fire & Sword, which will be appearing in the forthcoming edition of the Historical Novels Review. Anyway, my fears are groundless, and my eagerness justified. Fire & Sword has been given a marvellous review, and I’m really very, very chuffed indeed. So chuffed that I’ve cracked open a bottle of the good red stuff to celebrate! This entry was posted in Uncategorized on May 1, 2014 by louiseturner. 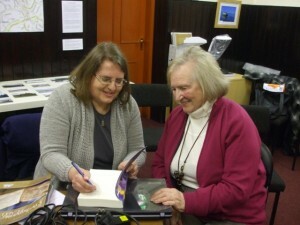 This time, I must say a big ‘thank you’ to Margaret Skea for inviting me to take part. It’s quite an appropriate chain of succession, because Margaret’s debut historical novel, Turn of the Tide, is set in late 16th century Ayrshire, and has at its heart the infamous feud between the Montgomerie and Cunninghame familes, the roots of which are explored in Fire & Sword, and indeed in its follow-up, which I’ll tell you a bit more about below! So please check out Margaret’s website at http://www.margaretskea.com – or better still! – buy her book if you fancy reading another unique take on the Montgomerie/Cunningame saga. Since I’ve been tagged by the author of a novel which features the Montgomeries so prominently, I thought it only right to give pride of place to the anti-hero of my debut novel, Fire & Sword, Hugh, 2nd Lord Montgomerie, who steps forward into the limelight for the follow-up. He’s based on a real historical figure: Hugh, 2nd Lord Montgomerie, later 1st Earl of Eglinton. Hugh, 1st Earl of Eglinton was the great-grandsire of Hugh, 4th Earl of Eglinton, who features albeit briefly in Margarent Skea’s novel. I don’t think I’m giving anything away of Margaret’s novel by telling you that Hugh, 4th Earl was assassinated by the Cunninghames in the late 1580s, marking the nadir of the feud. It’s an appropriate event to mention here, because arguably it was the way in which Hugh, 2nd Lord/1st Earl, conducted himself that had such dire repercussions for his descendant. 2) Where and When is the story set? My novel’s set in Scotland, in the period between 1489 and 1490. King James IV has not long succeeded to the throne following the murder of his father James III at the Battle of Sauchieburn in June 1488. Try as he might, James just can’t get a grip of his kingdom. He’s struggling to contain a rebellion led by John Stewart, Earl of Lennox and he’s reliant upon his local officials to try and calm things down and create some kind of peace throughout the land. In Renfrewshire, he has men like Sir John Sempill (newly won over from the opposing side) making a sterling effort to restore justice and prosperity. Elsewhere he’s forced to rely on men like Hugh, 2nd Lord Montgomerie, who just can’t seem to get their act together, succeeding only in generating yet more chaos in their efforts to rein in those who work against them. When I first started to explore the ‘real’ Hugh’s character, I thought, “Clearly, he’s a psychopath.” But as I delved more deeply into the documentary evidence, I realised that the truth was much more complex. He’s certainly given short shrift by historians – I’ve heard him described variously as ‘hawkish’, ‘the appalling Hugh Montgomerie’, and ‘what a b*****d!’ by notable worthies in the field! The ‘real’ Hugh, 2nd Lord Montgomerie (created 1st Earl of Eglinton in the early 1500s) was born in 1458 and died in 1545 at the grand old age of 87. He appears to have been an accomplished courtier, who was appointed to the Privy Council (briefly!) in 1489. After a spectacular fall from grace (explored in my second novel), he never really regained his earlier success until the post-Flodden period when he became an elder statesmen almost by default when he was one of the few senior figures to survive (or avoid) the Battle of Flodden. It was at this time, in the reign of James V, that he held a number of distinguished offices at the Scots court , including Justice General of the North and Acting Vice-Regent before finally retiring from active politics aged 78. Unfortunately, he’s best remembered locally for his persistent habit of bumping off his enemies. The first recorded incident was the murder of James, 2nd Lord Boyd (then aged 15) somewhere near Stewarton, Ayrshire, in 1483. Hugh was acquitted of this crime, but after this initial incident he seems to have been responsible (in one instance, personally responsible) for the deaths of two consecutive heads of the rival Cunninghame family. His marriage to one of the daughters of Colin, 1st Earl of Argyll, head of the powerful Campbell clan, may do much to explain his brutal, uncompromising methods; as a young man, he certainly appears to have spent some time in Campbell’s household. Hugh Montgomerie as I’ve portrayed him in my writing is impulsive, determined, and in our modern understanding, a bit bipolar. He lives by the motto, “Act in haste, repent at leisure.” If you catch him on the wrong day, in the wrong mood, you’ll be bludgeoned aside with absolutely no second thought. If he happens to be armed at the time, then your mistake will probably be a fatal one. In Fire & Sword, John Sempill says of Hugh, “He’s not a man; he’s a force of nature,” and John – who’s more perceptive than most – has probably got it spot on! 4) What is the personal goal of the character? Hugh’s driven by insecurity. He comes from a very worthy lineage – one of his ancestors fought at The Battle of Otterburn and defeated the famous ‘Hotspur’ following the death of the James, 2nd Earl of Douglas. With Hotspur’s ransom, the Montgomeries built Polnoon Castle, which became their family seat until Hugh, 2nd Lord/1st Earl moved it to Eglinton, near modern Kilwinning. As for the duel itself, it subsequently became immortalized in the Ballad of Chevy Chase. Hugh had his ancestor’s formidable reputation to live up to, but also had the misfortune to get off to a very shaky start when he was orphaned before the age of 12. At this age, he inherited his lands and titles directly from his great-grandfather. With no other senior relatives surviving, I suspect his wardship was purchased from the king (James III), as was customary at the time. Unfortunately we have no way of knowing exactly whom had this privilege, the only evidence coming in the form of a very testy document issued by Hugh when he reached his perfect age, stating that all grants made previously in his name are to be considered null and void. It’s my hunch (the historian in me cannot, unfortunately, back this up!) that Hugh was fleeced during his minority, and I also suspect that whoever these individuals were, they didn’t want to let go once their ward achieved maturity. Perhaps the Montgomeries’ infamous feud with the Cunninghame family began at this time – it’s quite possible Hugh was the Cunninghames’ ward (as well as being a respected local family, they were related to the young Hugh and would therefore have been a perfectly appropriate choice). I’m inclined to think it was Hugh’s own personal sense of grievance at these injustices (real or imagined) that originally fuelled the vendetta. Certainly, he’s a man who went through life with a massive chip in his shoulder – unfortunately for the Cunninghames, he was also gifted with the drive, the ambition and the energy to do something about it! 5) What is the main conflict, what messes up his or her’s life? Hugh would like us all to think that his life is messed up on account of those dastardly Cunninghames, but in reality he’s his own worst enemy. By the end of the events depicted in Fire & Sword, he’s got everything going for him. He’s a Privy Councillor, he’s a favourite of the King, and all these legitimate grievances that drove him (so he’d argue) to rebel against the previous king have been dealt with. It’s true that he’s made enemies, but I think if he’d responded against these threats in a more subtle and careful manner, he could have won through the crisis with his reputation intact. Instead, his habit of blundering onwards like a bull at a gate cost him a promising political career at the court of James IV. 6) Is there a working title of this story and can we read more about it? The working title is The Gryphon at Bay – I used this because the Gryphon/griffin is the supporter of the Montgomerie coat-of arms. It has the added advantage of being an ambiguous creature in heraldry & mythology. On the one hand, it symbolizes positive qualities such as wisdom and nobility, while at the same time it can be viewed as embodying the perversion of these qualities. Griffins are associated with the goddess Nemesis (who is linked vengeance and retribution) and they can sometimes also be associated with the Devil or the Anti-Christ. Given Hugh Montgomerie’s dual nature (a man you hate to love!) it seemed perfect to make reference to the griffin/gryphon in the title. The work is completed, and awaiting submission to my publisher, but nothing’s in circulation as yet. If your interest has been piqued, then I’d recommend getting hold of Fire & Sword, where we first meet Hugh and where we learn a great deal about what those around him think of him. i’m also working on a couple of short pieces of fiction – featuring both John Sempill and Hugh Montgomerie – which will probably be in circulation sooner. No information is available as yet, but as the old saying goes – watch this space! Unfortunately, my lovely editor at Hadley Rille Books – Eric Reynolds – has recently suffered some major health issues. As a result, publication schedules are wa-a-a-y behind, so I have no idea when things will be moving forward. Now it’s time for me to hand over the proceedings to the next batch of participants. I’m not sure whether this blog hop started out primarily for authors of historical fiction – if so, then I’m taking the liberty of broadening the catchment, by including a couple of fantasy writers. So can I introduce you to next week’s bloggers: poet and author Judi Sutherland (www.judisutherland.com ), historical fiction writer Juliet Waldron ( http://www.julietwaldron.com ) and also my fellow HRB authors Karin Gastreich (http://eolynchronicles.blogspot.com )and Mark Nelson (http://hrbpress.com/authors.htm) . This entry was posted in Uncategorized on April 21, 2014 by louiseturner. This is the first of two blog hops I’ve been tagged for today: to coin an old cliche, blog hops seem to be like buses – there are none for ages, then two turn up at once! I’ve recently finished the final edit of my second novel (Working Title: The Gryphon At Bay). The sequel to Fire & Sword, it runs almost directly on from the ending of its predecessor. It turns the spotlight onto the character who was very much the anti-hero of Fire & Sword: Hugh, 2nd Lord Montgomerie. This time around, Hugh finds himself in a difficult situation when he oversteps the mark by taking out one rival too many! I like to think that my work is distinctive because it sees history as a series of interweaving events generated almost by accident. ‘History’ comes about through the actions of various individuals who all follow their own agendas and are moved by broader loyalties which may include political or family allegiance. In that respect, I don’t have ‘goodies’ and ‘baddies,’ because everything depends very much on the perspective of the individual who’s at the heart of the story. A lot of the time, I get frustrated by historical novels driven along by narratives that give the impression that history is somehow pre-determined. It’s how individuals interacted with one another in the past that collectively generates what we see in the historical record, and this is something I try very hard to capture in my own work. I can’t say this approach is truly unique – I remember stumbling across a historical novel way back in 2004 which I avidly devoured because it encapsulated exactly that kind of fluid, constantly renegotiated past which I was trying so hard to capture within my own writing. The book in question was A Place of Greater Safety, and the novelist Hilary Mantel. A Place of Greater Safety remains my favourite historical novel, and quite possibly my all-time favourite work of fiction – full stop. I’m fascinated by people, in all their complexity. I’m fascinated by their achievements and fascinated by the evils that they are undoubtedly capable of. I studied archaeology because I thought it might inspire me as a writer of science fiction – the jump to historical fiction was unexpected, but perhaps inevitable, because the more I learned about Scotland’s rich and complex past, the more I felt there was an opportunity to increase its popularity amongst a wider audience. This is something which I think is especially true for the West of Scotland – so often, there’s a belief that ‘History’ is something which took place somewhere else, usually around Stirling, or Edinburgh. But there’s so much more to Scottish History than the Wars of Independence and Mary Queen of Scots, though it seems sometimes as if those periods are almost endlessly revisited while others, equally fascinating, are virtually ignored. I want to follow less well-trodden paths and acquaint myself with more obscure figures – I find it more interesting when the gaps between the facts are more extensive and require more of a creative leap on the part of the author. Creating believable characters is the most important part of my work. With Fire & Sword, I made an in-depth study of the various individuals at the heart of the novel: John Sempill of Ellestoun; Hugh, 2nd Lord Montgomerie; Margaret Colville; Matthew Stewart, Master of Lennox; Helen Campbell, and the rest. I acquainted myself with their biographies, I worked out who they married, who their close relatives were. This allowed me to map family – and therefore political – allegiances in detail. I noted certain facts about their family life – John Sempill appears to have been the only son in a family of five, while Hugh Montgomerie inherited his titles at the age of 12 from his great-grandfather. Little details like that informed upon the characters, helping to build them in my mind. With the characters formulated, all that remained was to chart their actions and interactions throughout time and space. I rigidly keep to the facts as best I can when they are known (and I’m dealing with a very poorly documented period) and I gather together these facts by scouring the local historical accounts and also the secondary sources for any references to any of my characters so that I can weave a believable narrative which accounts for these facts. It’s a very complex process, but it’s very fulfilling, too: these days I usually find it quite easy to convince my cast members to behave as expected and as a result, they independently re-create history as it actually happened! I never consider the process of researching to be over, which means, of course, that there are always times when I stumble across a Little Known Fact Lurking in some obscure source somewhere which can rattle my expectations and assumptions. So far (touch wood! ), I’ve been able to work my way round all these nasty surprises. And now it’s my very great pleasure to hand on the metaphorical baton to my next three authors – Gillian Pollack, Judi Sutherland, and Juliet Waldron – whom you can find out more about below. Judi Sutherland took a gap year after redundancy from the pharmaceutical industry, and studied for an MA in Poetry at Royal Holloway, University of London. Since then she has written the first draft of a novel and quite a lot of poems. She has taught Poetry to the Petrifed in Newbury, Berkshire and will be the Poet in Residence at the Ampthill Literary Festival in July. Her blog is at www.judisutherland.com. I’ll be attending not one but two author events this coming weekend (Saturday 5th April) at the Renfrewshire Witch Hunt 1697 Heritage & Creative Hub (located on the ground floor of the Paisley Centre). At 11am, I’ll have my novelist’s hat on for an author event where I’ll be reading excerpts from the book. And in the afternoon (1.30pm), I’ll be back, cunningly disguised as an archaeologist, for an illustrated lecture on the historical events which form the basis for the novel. With a particular emphasis on Paisley, of course, which was made a burgh not long into James IV’s reign, thanks to the efforts of Abbot George Schaw (of Paisley Abbey) who appears to have acquitted himself rather well during the Battle of Sauchieburn in June 1488. To find out more, and to enjoy some more tales (factual and fictional) of late 15th century mayhem, please come along! 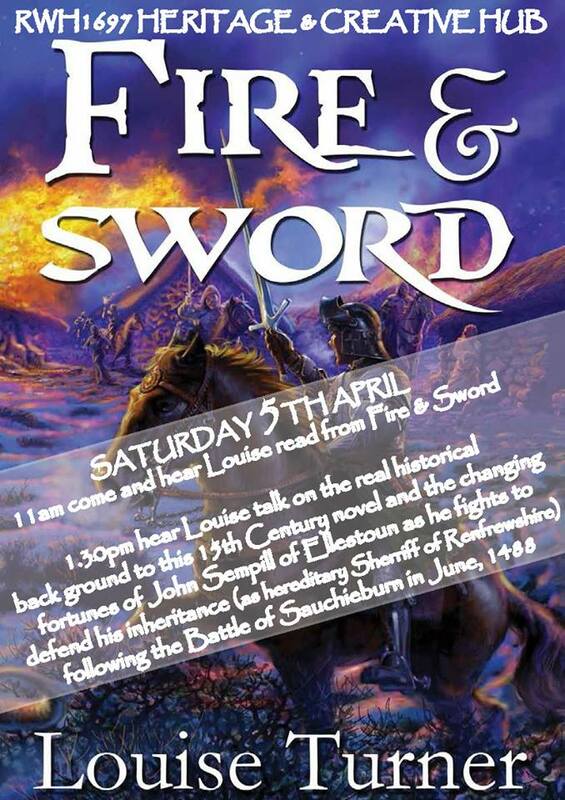 Copies of Fire and Sword will be available to purchase on the day, courtesy of the RWH 1697 Hub and local Paisley bookshop, Abbey Books. This entry was posted in Uncategorized on March 30, 2014 by louiseturner. Last night, I had the pleasure of presenting a lecture to Beith Cultural & Heritage Society on ‘The Lords of the Westland’: Some Ayrshire Families & The Rise of James the Third’. It considered the real historical events that are recreated in ‘Fire and Sword’, and looked at some of the individuals who feature in the novel, with John Sempill of Ellestoun and Hugh, 2nd Lord Montgomerie studied in particular detail. When the lecture was over, there followed a lively question-and-answer session on how fact had been transformed into fiction in the process of creating the book. I had a lovely time there. My hosts were extremely welcoming, and while I didn’t shift many books, I signed a few that had been bought previously, which was very gratifying! It was a real pleasure to chat with future readers who were looking forward to getting into the novel, and who’d enjoyed this opportunity to get the facts presented to them before they embarked on the fictional version of the story. 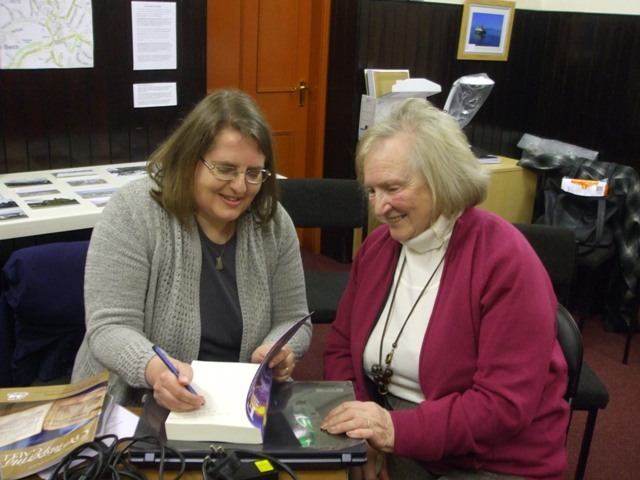 I was also delighted to meet up with Ann McMillan, Honorary President of the Dorothy Dunnett Society, who’d travelled all the way up from South Ayrshire for the occasion. A signed copy of Fire and Sword was purchased there on behalf of the Society – which is destined to be given out as a raffle prize at their annual dinner! To receive this news is – as you may imagine – quite an honour!! 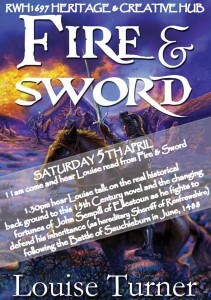 My next appearance will be on the 5th April in Paisley, where a veritable extravaganza of ‘Fire and Sword’-related activities will be taking place, including readings in the morning and a lecture in the afternoon. There will, of course, be a particular focus on Paisley and its abbey – the abbot at the time, George Shaw, was deeply embroiled in the coup and even fought at Sauchieburn for James IV. For more information concerning dates, venues, etc. watch this space!! In the meantime, copies of the book can be purchased locally at Abbey Books in Paisley, Beith Town Hall, Beith, and the Renfrewshire Witch Hunt 1697 Hub in the Paisley Centre, Paisley. This entry was posted in Uncategorized on March 22, 2014 by louiseturner. I’m delighted to announce that I’ve finally finished editing my second novel (working title ‘The Gryphon at Bay’) to a level where I’m now happy to send it out to my publishers. Set immediately after the events in ‘Fire & Sword’, it turns the spotlight onto the incorrigible Hugh, 2nd Lord Montgomerie: I suppose, if I was to summarise it succinctly, I’d say it was a novel about hubris, & about the changing whims of Fortune. I’ll leave things at that just now, I think. So far, ‘Fire & Sword’ has earned 6 5-star reviews on Amazon (3 5-star reviews from each side of the Atlantic): to receive such positive feedback from readers gives real encouragement to a writer, providing us with just the impetus we need to keep on working hard to complete novels and get them out into wider circulation. Unfortunately, I can’t give you any idea of if and when ‘The Gryphon At Bay’ (if indeed, that remains its title) will be approaching publication as my editor & publisher at Hadley Rille Books, Eric Reynolds, has been taken ill and it’s not likely he’ll be back at his desk any time soon. Eric’s been a solid and enthusiastic supporter of my work, and without his decision to publish ‘Fire & Sword’, I don’t think I’d be here now celebrating the completion of my second novel, which only took a mere 9 years to finish! So it seemed obvious to me as I added the finishing touches to the MS that ‘Gryphon’ should be dedicated to him. With this major project completed, I’ll be taking my foot off the gas for a while and concentrating on trying to widen public awareness for ‘Fire & Sword’ both in Scotland and further afield. I’ll also be getting on with my third novel, which is a wee bit different from what’s gone before, I must say, as well as starting the long process of researching novel #4, which will be the next installment of my late 15th century series – let’s call it ‘The Westland Chronicles’ for the time being, though this isn’t exactly official right now! I have some vague ideas as to what will happen next in the story arc, because I’ve read the historical accounts. But how these vague hints eventually transform themselves into a narrative will be as much of a surprise to me as they will, hopefully, be to you, and the process of this transformation will, I hope, be great fun to be involved with! This entry was posted in Uncategorized on February 23, 2014 by louiseturner.